Schoen Associates successfully renovated and restored this formerly abandoned and deteriorating Great Northern railroad freight depot, which was placed on the National Register of Historic Buildings. The architects created a complex of affordable multi-family housing anchored by a single 5,000 square foot commercial suite. The existing building size, 50'-0" by 415'-0", had approximately 21,000 feet of floor area. A dance studio occupies the commercial space on the north end, while the remaining space is divided into six bays, or "docks", each containing four or five apartment units. To allow entrance into the units and proper escape from sleeping areas, exterior entry courts were cut into the building. Skylights are designed into these courts to allow natural light and improve ventilation for the units, especially at the added loft level. 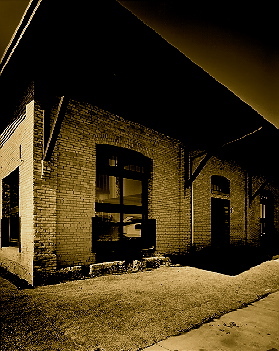 The outdoor garages present the same long, low lines as the main structure and used salvaged exterior windows, maintaining the character of the depot. Wherever possible, existing features of the building we highlighted. Over 40,000 square feet of sandstone pavers were salvaged and re-used for the parking and walk areas. The existing common brick masonry walls were stripped and cleaned. New refinished wood windows matching the original overhead door configuration were installed. The original character of the building largely preserved makes this housing project unique to Grand Forks and one of the factors in a contiued 100% occupancy with low tenancy turnover.